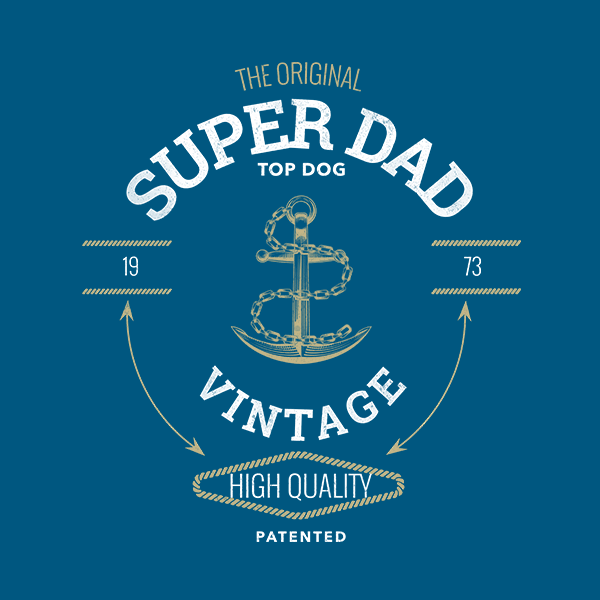 Show Dad He’s Still Top Dog with Father's Day Shirts! Father’s day is not just a great day for fathers, it’s also a great day for Father’s day shirt sellers! 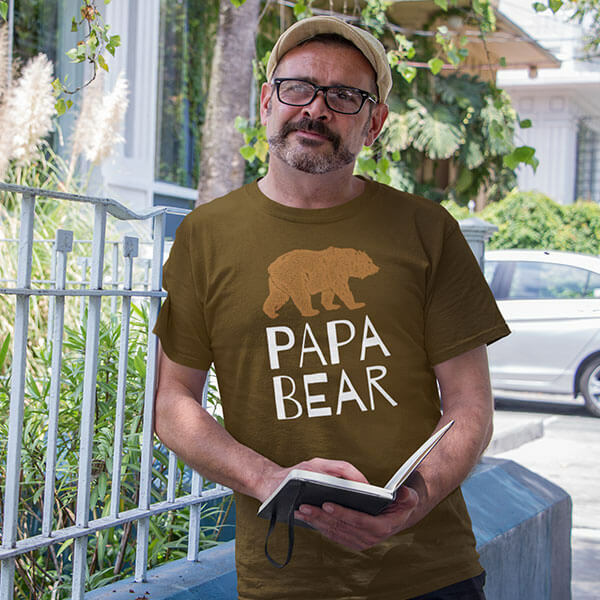 It’s time to get those creative juices flowing and start designing some great-looking dad shirt designs that will be this year’s runaway hit and have other t-shirt sellers scrambling to catch up. Don’t just let this Father’s day pass by without trying your hand at some Father’s day shirts! With Placeit’s T-shirt design makers, it’s ridiculously easy to quickly generate several fantastic designs and better yet, make several variations to test which ones perform best! A Dad Shirt on Every Dad! As we get closer to Father’s Day, your customers are going to be wondering, as they do each year, what they should get their dads as a gift. Let’s be honest, everyone is busy, but that doesn’t mean they’ll settle for just anything for dad. 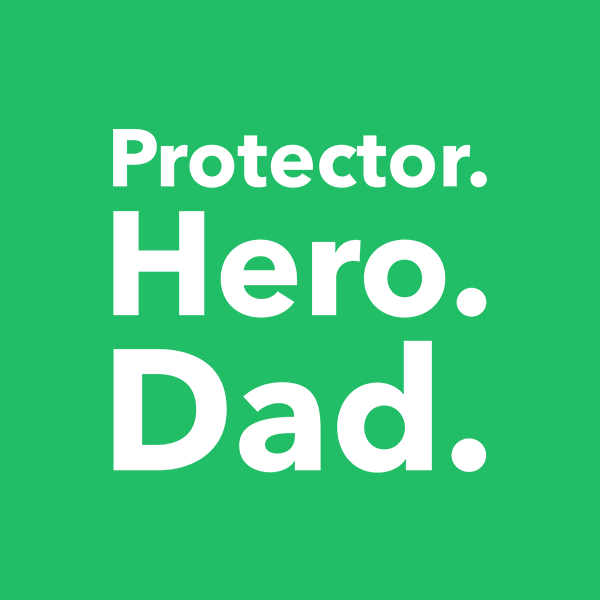 Use this third Sunday in June as an opportunity to make your customers lives easier by providing them with some unique dad shirts they can gift their dads and actually feel like they got a thoughtful and unique gift that won’t be tossed after one use. 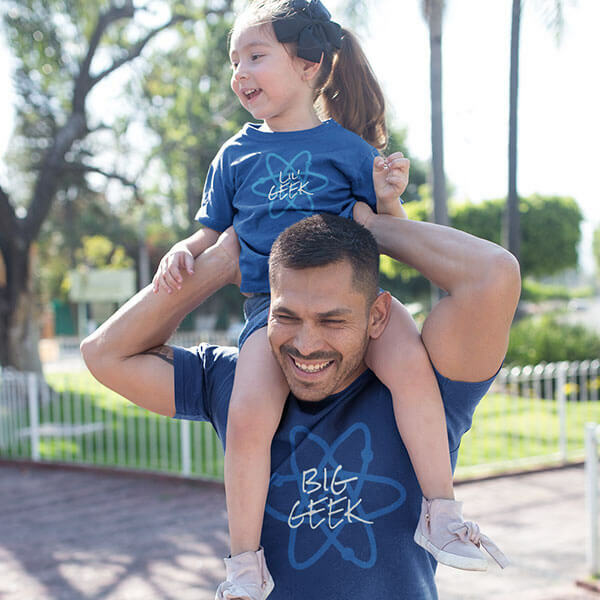 Make this Father’s day easy for your customers with some awesome Father’s Day t-shirt designs, read on to see how easy it is to make tons of unique and professional designs your customers will love with a little help from your friends at Placeit. As most online t-shirt sellers know, the only thing constant about the t-shirt business is that it’s always changing. New trends pop up overnight and others die out without apparent rhyme or reason. That’s why successful t-shirt sellers are always on top of the latest trends and finding ways to incorporate them into their niche. It doesn’t matter if you’re not entirely sure what type of design would work best for your niche right now, one of the great things about Placeit’s t-shirt design makers is that with any subscription you can use them to create an unlimited number of variations of one design and test the different versions to see which one resonates the most with your audience! If you start testing a week or two before Father’s day, you can narrow down which designs will be most effective and focus on just promoting those as the big day draws near! In the example below we made several variations of one design in a matter of seconds, with Placeit, it’s incredibly easy to test and quickly get feedback! If you’re used to using tools like Illustrator or have tried some of the other t-shirt design makers available on the market you’ll immediately appreciate the simplicity and the speed of Placeit’s t-shirt design makers. There’s no dragging graphics or text around, no webapps crashing or freezing on you, and definitely no complicated and clumsy interfaces. If you can fill out a form, you can use Placeit’s t-shirt templates to make some fantastic dad shirts your customers will love! Make Awesome Dad Shirts Now! Use Some Father’s Day Mockups to Promote Your Sweet Designs! 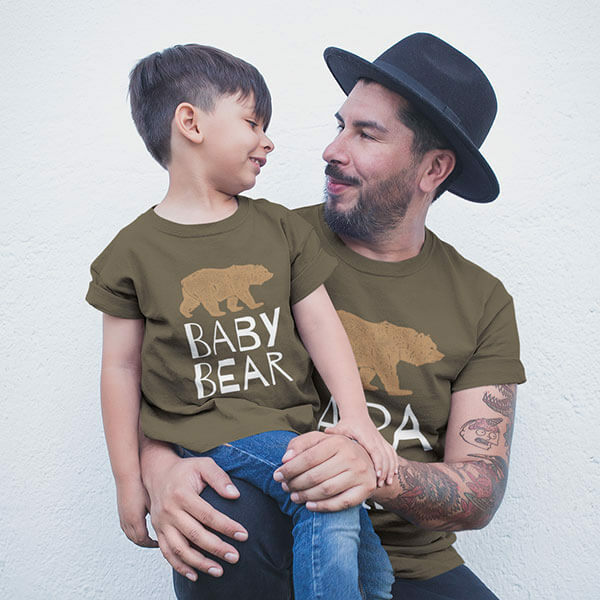 Once you’ve created some unique Father’s day shirts, you’re definitely going to want to promote your designs on your website, social media or whatever channel you normally use to sell your designs. Nothing helps sell your fantastic dad shirt designs like some professionally shot and edited t-shirt mockups. These Father’s Day mockups are specifically created to help show off your t-shirt designs with visual clarity and quality. 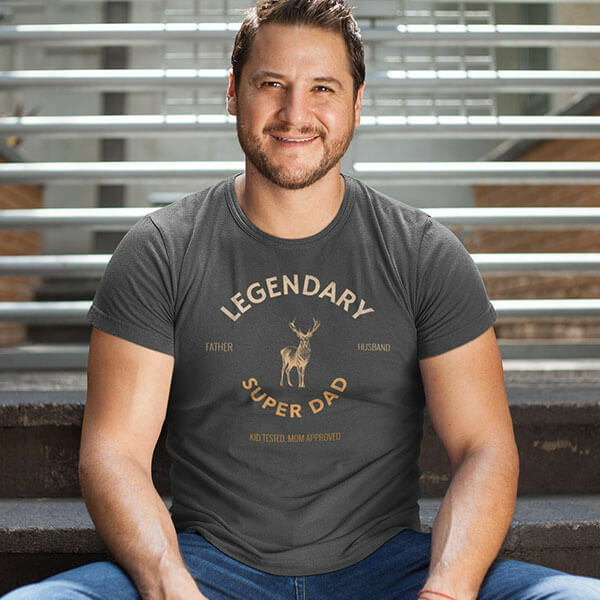 Don’t just stop at making great t-shirt designs, make sure they look incredible and stand out from the competition with incredible Father’s day mockups! 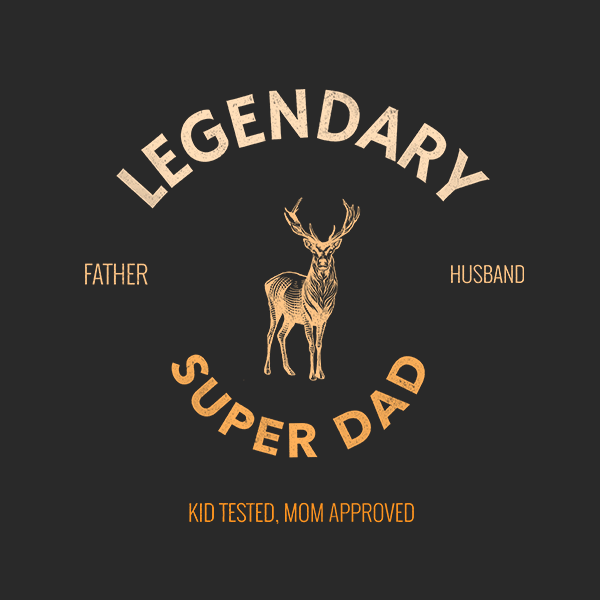 Placeit has some fantastic dad mockups that are perfect for showing off your unique Father’s day shirt designs. These heartwarming mockups are just what you need to remind your customers that Father’s day draws near and they still haven’t bought a gift for their dad. Make it easy for them to solve their dilemma with your unique dad shirt designs! Below are a couple of examples of Placeit’s great Father’s day mockups to give you some ideas and get you started. Double the Father’s Day Fun (and Sales) with Father Son and Father Daughter T-Shirt Designs! Don’t miss out on the opportunity to create some complementary father daughter and father son T-shirt designs. This is an easy way to offer your customers with small children something they can purchase for themselves and their little one on that special day. 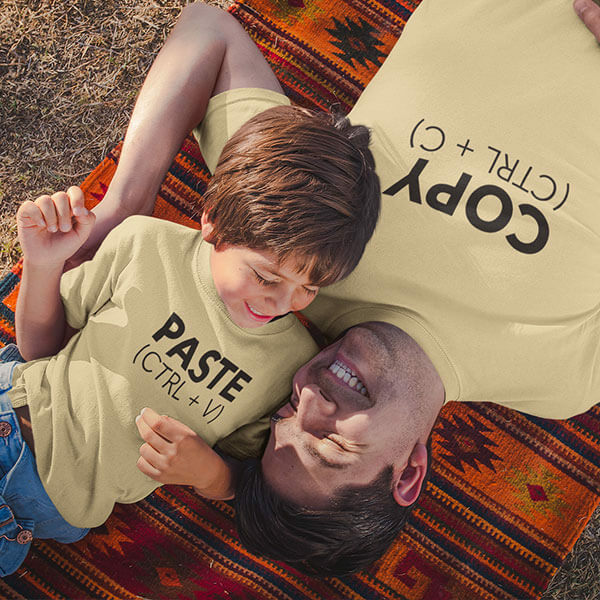 With Placeit’s father and son t-shirt mockups you can easily make some complementary or matching father and son shirt designs and quickly turn them into attractive ads for your unique father and son or father and daughter t-shirt designs. 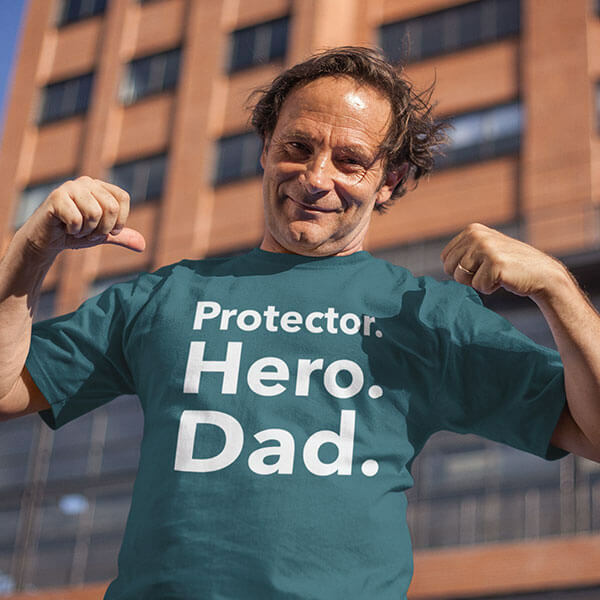 Father’s day is just around the corner, don’t miss out on offering your customers some unique and charming Father’s day t-shirt designs they’ll actually want to buy for their dads. Give your customers a better alternative to the boring tie, golf club, watch or electronic gizmo that will end up in a drawer or closet somewhere instead of actually being a thoughtful and charming gift that they’ll end up cherishing and actually using! Make Unique Father’s Day Shirts Now! "With Placeit, making tshirt designs is always easy!"